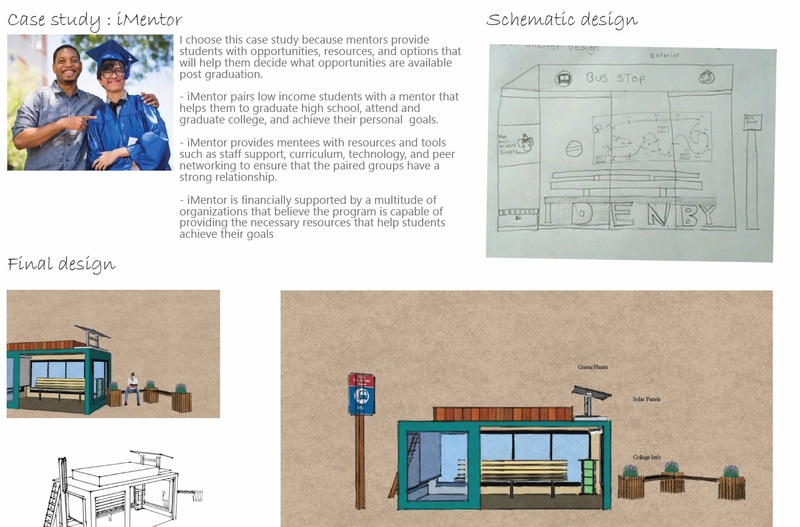 DETROIT – A high school class in architecture, taught in the spring 2016 semester by Lawrence Technological University staff, has produced at least one budding architect, as well as a whole bunch of good ideas on building a better bus shelter. The class was taught by Meaghan Markiewicz, MAr’17, MoUD’17, who is now working as STEM program associate at LTU’s Marburger STEM Center, the clearinghouse for the university’s K-12 science, technology, engineering, mathematics and design education outreach efforts. The class was housed at LTU’s Detroit Center for Design + Technology (DCDT), 4219 Woodward Ave. in Midtown. In the class, students from Denby High School were asked to choose a vexing social issue in their neighborhood on Detroit’s east side. Students chose everything from homelessness to lack of educational achievement to gang violence to teen pregnancy. Then, the students researched the social issue, including digging up national and local data on the problem. Finally, they were asked to design a bus shelter that would contribute to solving the problem. Along the way, the students also learned about the basics of architecture – how to calculate scales and square footage, how to prepare floor plans and elevations, and the basics of construction materials. The students then created posters about the problem they chose to tackle, using their research on the issue and their architectural design, learning architectural and graphic design software along the way. Finally, they each gave a presentation on their poster to industry experts. A shelter providing child care resources for young parents. Smith added: “My favorite part about the class was being able to design something myself, having the freedom to design a bus shelter that would benefit people.” Smith said he’s “extremely excited” to begin classes at LTU this fall. “I’m ready to increase my knowledge and be around like-minded individuals,” he said. For more information on how Lawrence Tech’s Marburger STEM Center can help other institutions create similar design-based educational and professional development events, contact Markiewicz at mmarkiewi@ltu.edu.